Ah! 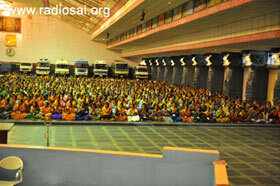 What an evening it turned out to be - for everyone - the devotees, the students and the volunteers. Swami has always rewarded service and from the past month and a half, He has started a new medium to pour blessings on the sevadal volunteers. After the week long service is complete, the volunteers assemble in the Poornachandra auditorium for a private session with Swami. 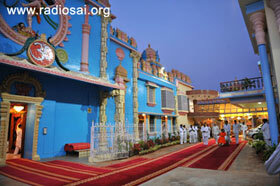 At 6:40 p.m., Swami arrived out from the Yajur Mandir and headed straight into the Poornachandra auditorium. The volunteers from the state of Maharashtra were so happy to see Him come and there was a loud applause and those hands that were not busy clapping, went up in reverential salutation to Him. Swami moved down the stage and along the carpet. He accepted roses from the volunteer leaders and blessed them. He sat on the small stage that had been set up and asked the ladies in the front as to what they were holding in their hands. 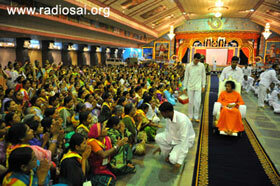 They then came forward and offered to Swami the trays of prasadam which was to be distributed to everyone. 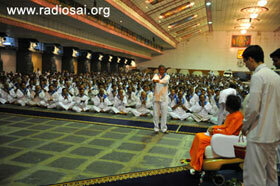 When the prasadam from the gents side came up, Swami was gazing at the volunteers seated. He said that He would move down and amidst them. Slowly, coming down the ramp, Swami entered the central path. There was glee and everyone rejoiced at this opportunity o close darshan. Swami was blessing and looking at both sides of the path. He moved all the way till the rear end of the hall before returning to the front in the same path. When Swami made an indication, everyone mistook that Swami was asking for aarthi. As the camphor was being waved, Swami said that He wanted to go along the other paths too! Saying so, He pointed in the direction of the west end of the hall. And so, Swami moved through the small passage between the gents and the bounding wall of the auditorium. Coming to the back, He moved all the way across to the ladies’ side and repeated His round of grace! The thrill and fervour of the people was palpable! There were many ladies who were simple village folk. In awe, reverence and devotion, they were completely prostrate on the ground. It was such an inspiring sight to see this uninhibited display of devotion. It was humbling too! Swami completed a round along the periphery and then came to the front again. Blessing everyone, Swami moved out of the auditorium. Getting into the car, Swami granted darshan in the Sai Kulwant Hall. He tossed vibhuti packets to many people from His car window. As the bhajans were on, Swami came on the stage at about 7:05 p.m.
Once on the stage, Swami tossed a few vibhuti packets to some of the students in the front. And then He called one of the students holding a tray for blessings. 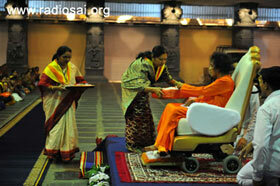 Showering him with akshatha grains and granting padanamaskar to him, Swami blessed him. As is the practise, all the others too holding trays and cards made a beeline and went to Him one by one. And Swami blessed them! A dozen boys later, the line still seemed to be on! Project reports, cards, akshatha grains, birthday trays - the line was going on and on. 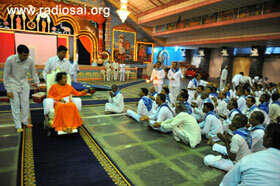 Swami was sitting patiently and thus it was that about 30 students got blessed! 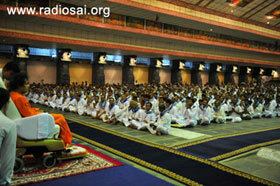 At 8:00 p.m., Swami received aarthi. Blessing everyone in the audience, Swami retired for the day.